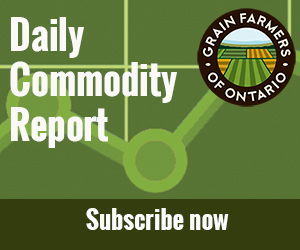 Ontario Grain Farmer readers are already very familiar with SellSmart, Grain Farmers of Ontario’s grain pricing app; users of the app will be pleased to know that a major update is coming this summer with some new features and improved functionality. SellSmart was designed six years ago to assist farmers in Ontario in selling their corn, soy, and wheat by providing delayed futures pricing data from CBOT and adjusted cash prices for grain elevators across Ontario. A lot has changed since then – both for Grain Farmers of Ontario, which now also represents barley and oat growers – and in the world of mobile apps. SellSmart has been re-built from the ground up to meet new standards for accessibility and responsiveness. We have improved the user interface and added support for US dollar pricing; most importantly, the app will now be able to handle barley and oat pricing (although at this time pricing data is limited). The new version of SellSmart is set for release in June 2016 for iOS, Android, and the BlackBerry BB10 operating system. Users with older BlackBerry devices will still have access to the old version of the app. If you don’t already use SellSmart, you can download it now for iOS, Android, or BlackBerry. You will be able to upgrade it for free when the new version is released.